After years of trying to acquire star players to help bring them back to the old days of glory, the New York Knicks have found their new superstar in an unlikely source. The Knicks have found their new man in the form of an undrafted Harvard man from Northern California. 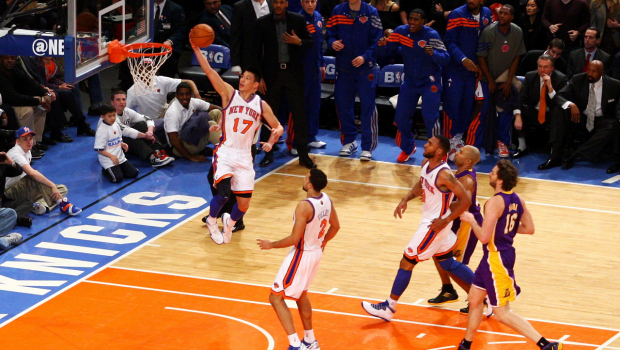 Jeremy Lin is the new point guard for the Knicks. In a season where top paid players Amare Stoudemire and Carmelo Anthony have struggled to get the Knicks two back to back wins, Lin has led the Knicks to five straight wins while Amare and Melo have sat out and Tyson Chandler led the way on defense. The 23 year old has scored at least 20 points in each of his five games leading the Knicks, including a career high 38 points against Kobe Bryant and the Los Angeles Lakers. Lin, who is already receiving “MVP” chants from the fans at the Garden, has set the record for most points scored by a player in his first five starts. When Amare and Melo return, the hope is that they mesh well with Lin and Chandler. And when Baron Davis returns, the hope is for the team to have a well rounded starting five that could put them in position to win their first NBA title since 1973.